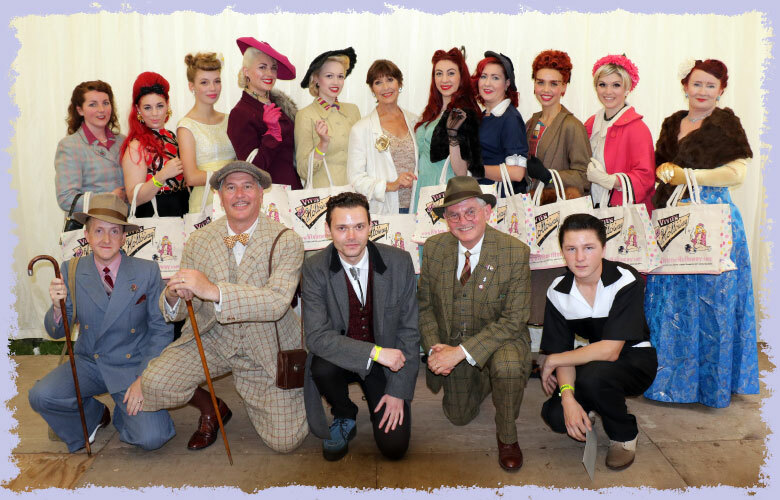 Another year, another wonderful Mr & Miss Vintage UK competition! The epic conclusion of 2015's search for the most stylish guys 'n' gals was reached on Sunday 30th August, with special guest Anita Harris (centre). Showcasing the best fashions from decades past, we could not be more proud of our fifteen finalists, who all looked absolutely fabulous! We are delighted to announce that Danielle Cameron was crowned Miss Vintage UK 2015, and George Luck is Mr Vintage UK 2015! The ladies are (from left to right) - Claire Ashworth, Amy Elizabeth Tate Pierpoint, Molly Anne, Lori Jade, Danielle Cameron, Anita Harris (host), Harriet Grace Eaves, Amy Bellehewe, Lois Wickett, Charlotte Maughan Jones and Elaine Duffy. Charlotte Maughan Jones took 4th place, with Lori Jade in 3rd place and Lois Wickett in 2nd place, with Danielle Cameron as the overall winner! The men are (from left to right) - Rowan Peare-Hart, George Luck, Joseph Counsell, Chico White and Dylan Bunce. George Luck took first place, with the other four chaps sharing a joint runners-up position. Congratulations to all our finalists, and of course thanks to all who entered this year - we hope to see you again in next year's competition! Many thanks to our hosts - Anita Harris, Dusty Limits, Lola Lamour and Mark Ewing - and to our judges - Vivien Wilson, Rachel Egglestone-Evans, Lola Lamour and Mark Ewing. Stay tuned for details of next year's competition, which is sure to be even bigger and better!